On Thursday evening, just after sundown, I was privileged to witness Fuzzy the Owlet’s first steps out of the nest box. Great view from behind: look at those claws! I didn’t expect that Fuzzy’s first steps into the great outdoors would occur that evening, but I was wrong–I guess little owls know best. 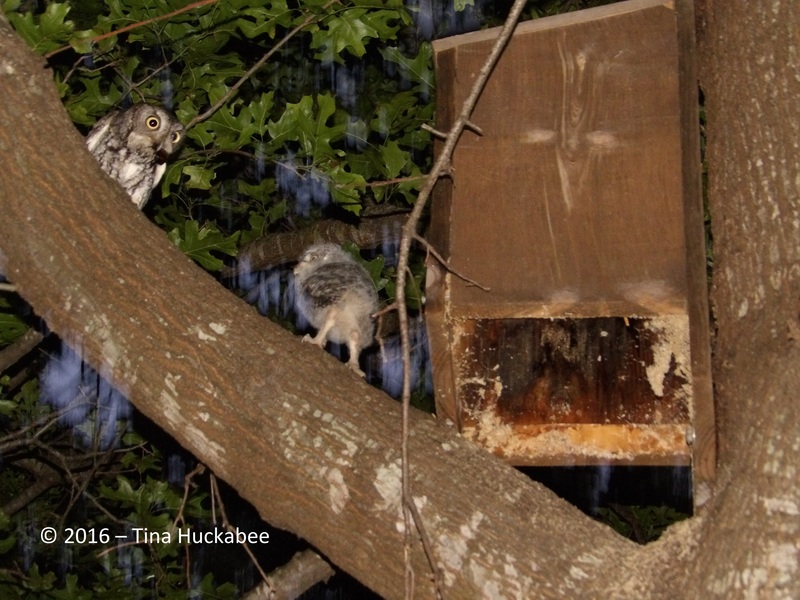 I saw Daddy Owl swoop in front of the box, trill while carrying what looked like a dangly and juicy worm, and baby hopped right out of the nest box and onto the branch to greet Dad, the worm, and the outside world. Dad fed the morsel of worm to Fuzzy prior to this photo. Fuzzy walked/hopped along the branch for the next hour or so, enjoying visits from both parents and made good owly progress during the night by stretching his wings and legs. Yikes! It’s a long way to the ground and why is that weird bird with the three eyes making smoochy noises at me? I didn’t see Fuzzy or Dad at all on Friday, though Mama was in the neighbor’s ash tree, adjacent to my own oak tree which hosts the nest box. Today, I didn’t see the adults until mid-day when I heard the raucous complaints from other birds, alerting everyone to the owls’ presence in my neighbor’s back tree–the same tree where Dad sometimes roosts. With my handy binoculars, I spied Mom and Dad, but no Fuzzy. I’m guessing that Fuzzy is nearby though, considering that the parents are roosting together, which is not typical. Additionally, one of Fuzzy’s siblings made his/her appearance today. I think I’ll call this one Frizzy. 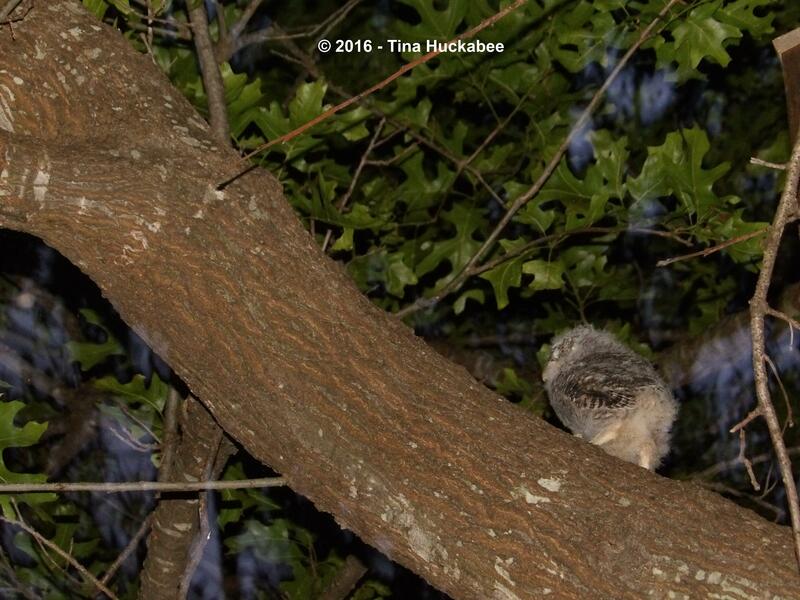 This entry was posted in Backyard Birding, Eastern Screech Owls, Uncategorized, Wildlife Gardening and tagged Biodiversity, Eastern Screech Owl house by Tina. Bookmark the permalink. Even cuter than the last photos, Tina. I feel really lucky that your little owls appeared on my screen this morning! I’m glad the owls have made your day, Cathy! 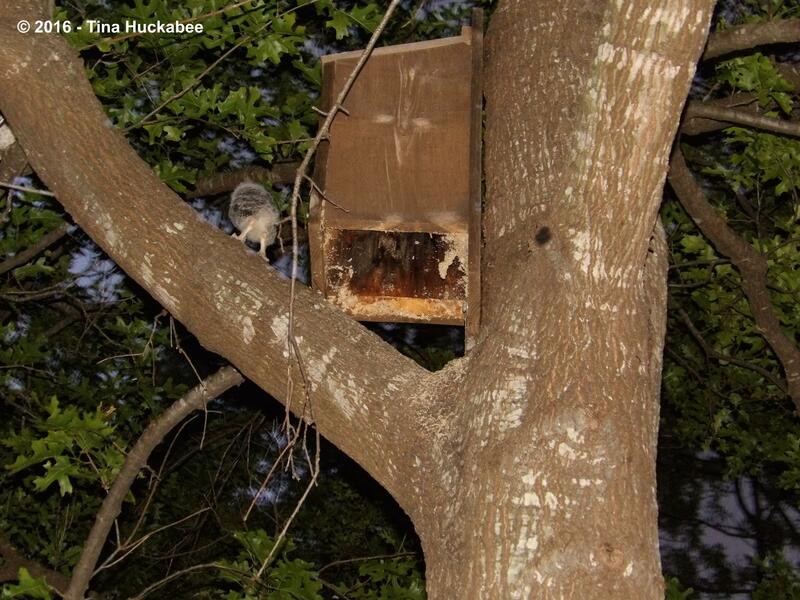 It’s so great that you were there to see Fuzzy’s exit from the nest box! Frizzy looks ready to meet the world soon, too. I imagine you’re going to be hanging in the garden a lot this week. So fun! It was exciting, Tracy. Generally, I’ve seen the owlets the next day, perched in the trees. I guess it’s good that I saw this first one leave, because I haven’t seen him/her since. So far, this is my favourite of your posts. The babies are simply gorgeous. Well, if we were sane, we wouldn’t be doing this…. The babies are beautiful, I agree. So cute! Every time I read your posts I want to put up an owl box but I’m not sure the little birds in my garden would appreciate that and I have so many. Haha. The little birds in the ‘hood do shout their displeasure. In fact that’s often how I find the owls–chickadees, wrens, cardinals, blue jays–all raising a stink because of the owls. You are a very lucky lady Tina, how absolutely wonderful to share your space with these beautiful babies. I am loving watching their progress through your posts! I agree! 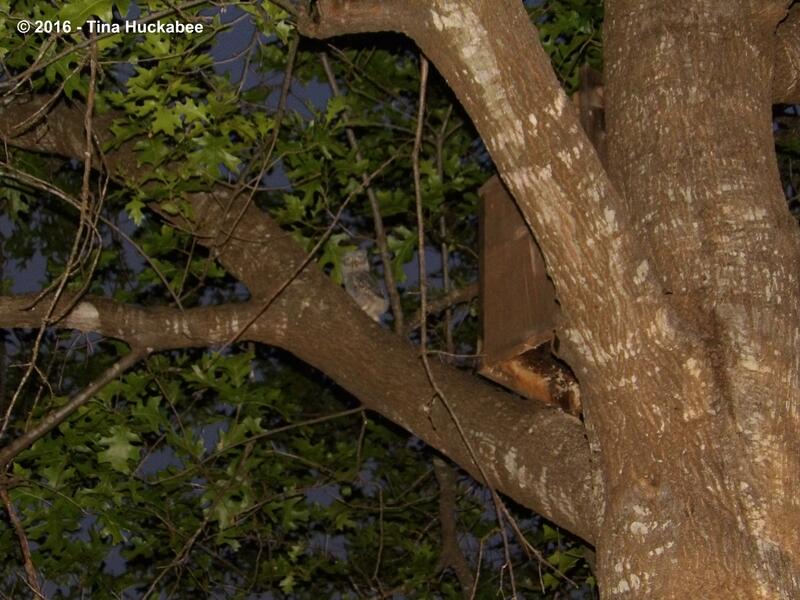 The only problem is that they’re a cheeky bunch: both babies left the nest box and have made their way over the the neighbor’s tree–so they’re no longer in my tree–boo! But there may be others–we’ll keep a watch for them!! Glad you’re enjoying them! I can’t believe I almost missed this post – completely careless of me and what a loss that would have been, because….that fuzziness! That frizziness! Absolute cuteness that deserves a lot of shouting and announcing…”make way…make way…for the new kings/queens of the tree tops!”. Wonderful photos and thank you so much for sharing them with those of us not so gifted with owliness! 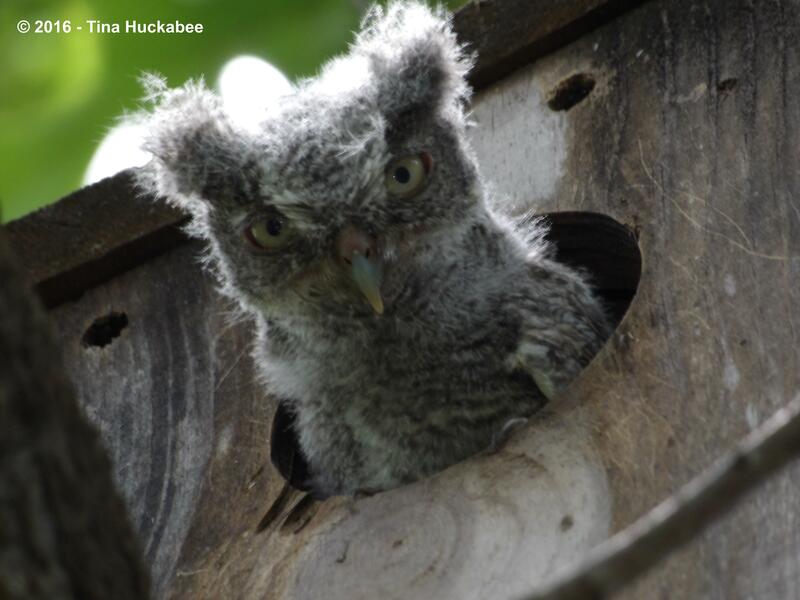 Cuteness is the name of the game when it comes to owlets. I wish the little toots would have stayed around MY tree, rather than migrating away so quickly. I guess they (and their parents) were tired of my gawking. I’ll check later today to see if there’s another ready to leave the box. If so, expect pics at some point! That’s just like kids for ya! Always eager to get AWAY just when they are getting to be so interesting and such good company! OMG, they are TOO cute! 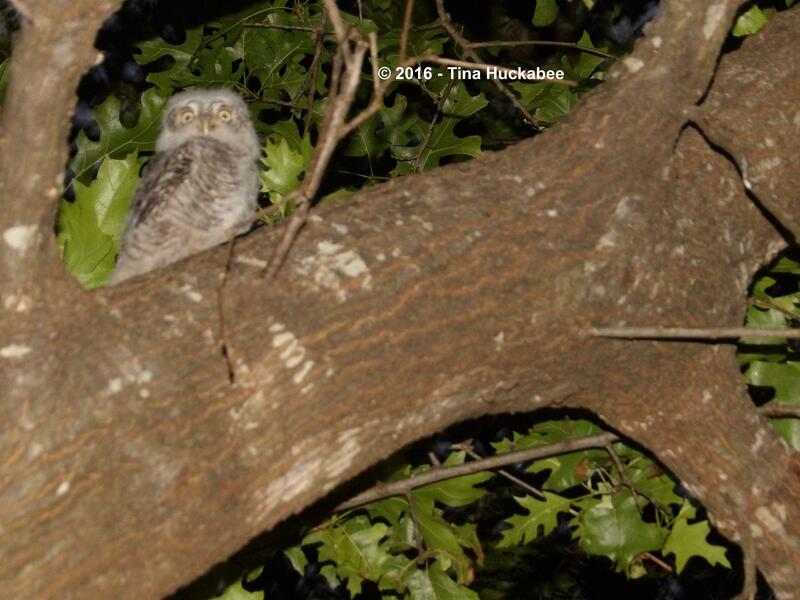 Lucky you to watch them develop, and lucky owlets to have such a special place to grow up. Aren’t they just the most darling things? It’s been such a gift and an education to watch these beautiful birds. Every year, it’s different–never a dull moment. Terrific pictures, and I love the names too. Thanks, Pam. The names are silly, but if you can’t be silly on your own blog, where can you be?